The main room is surrounded on three sides by floor to ceiling windows and the views are spectacular - I was early to meet my friend Ian for breakfast so I had plenty of time to take it all in - it is really amazing to be able to see pretty much all the main landmarks of London - the Olympic stadium and the Orbit Tower, Ally Pally, the BT Tower, the Shard, Tower Bridge, St Paul's - I could have spent the whole day just staring out the windows. 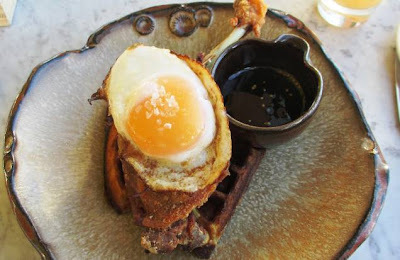 When the time came to order, there was only one dish I was ever going to order, the eponymous duck & waffle - crispy duck leg on a waffle with a fried duck egg on top and a pot of "mustard maple syrup" (inspired) on the side. As much as some people have expressed some squeamishness at eating crispy duck for breakfast, this was seriously one of the best breakfast dishes I have ever eaten. Chef Daniel Doherty is a genius. I could eat this every day - the salty, crispy duck (perfectly cooked) on the soft waffle, runny egg yolk and mustardy, sweet maple syrup combo was sublime. If I had one criticism it was the coffee - not terrible but not great. A top notch flat white would have made an amazing breakfast experience perfect - but you can't have everything right? Anyway - as well as serving a great breakfast, this place is super fun and with 24/7 opening hours I am planning many more visits - I need to sample some of the all-day menu and sip a few whisky sours as the sun goes down over my beloved London. 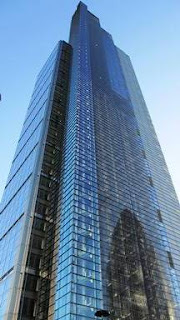 That duck & waffle dish looks AMAZING!!! Kat - you have to try it, it rocks.